Ever since Fatto A Mano first opened their doors on London road in the summer of 2015, the people of Brighton have been crazy for their wonderfully simple Neapolitan pizzas and menu. 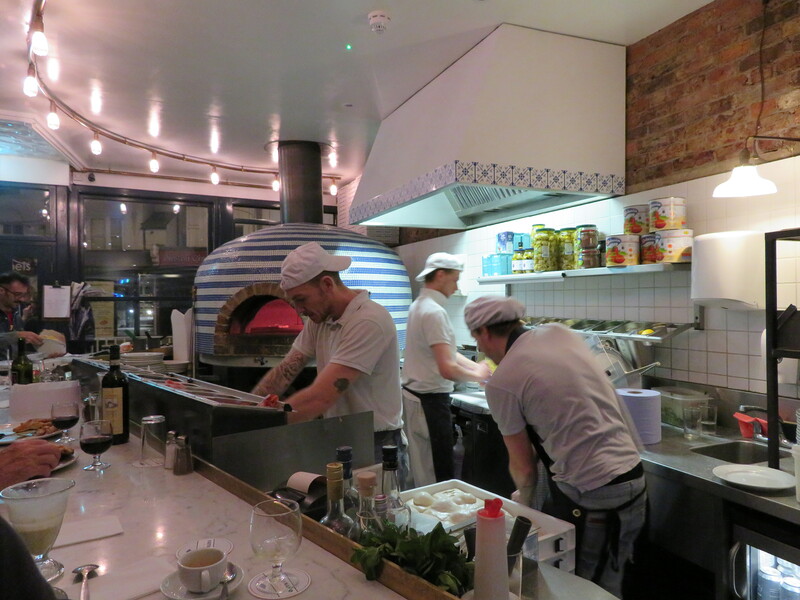 Their ethos is to offer simplistic pizzas and dishes using good quality ingredients that speak for themselves. My partner Daz being a huge pizza fan had us booked in there just a month or so after opening with a few of his Italian friends after hearing very good things. I went along too, but being gluten intolerant I ordered just Campania fries and Caprese salad and was incredibly jealous of everyone’s pizzas. Although very tasty (those fries are a must have), it just wasn’t the same of course! 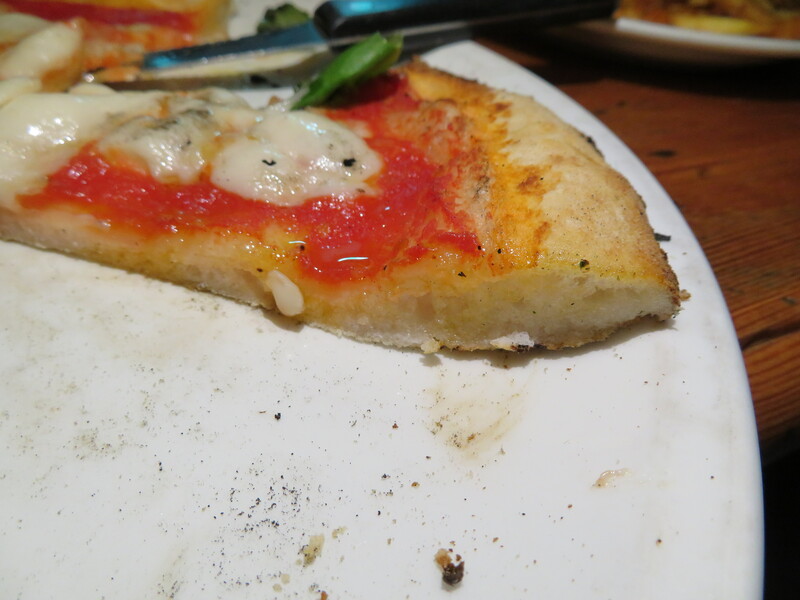 Until recently has only been one authentic pizzeria in Brighton that made their own gluten free bases from scratch. Pizza themed date nights with Daz always ended up there, as I find all other gluten free bases that are brought in are either far too anaemic, squeaky, or flat and crispy which is not really my thing. So when I heard Fatto A Mano were working on a gluten free pizza base I was super excited to try them, I could finally see what all the fuss was about! Fatto a Mano started serving their gluten free bases in their restaurants I think just over a month ago, but didn’t want to officially launch until it was practised to perfection and they had it just right. 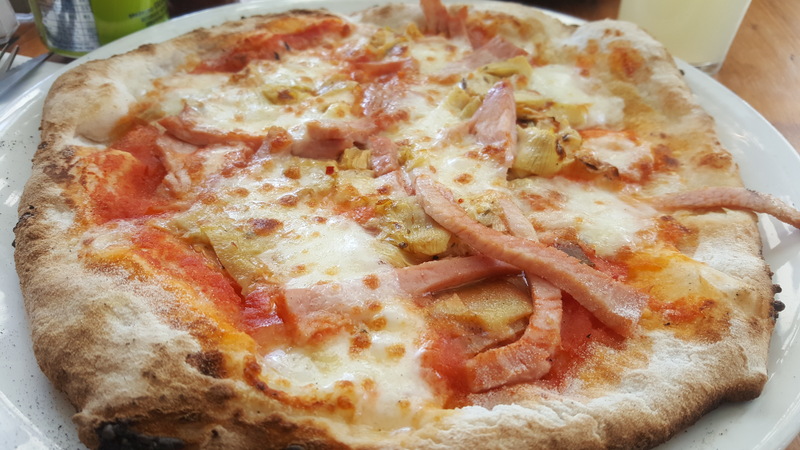 I went there a couple of weeks back for a colleague’s leaving lunch at work (as it’s one of her favourite restaurants) so was able to sample their gluten-free pizzas then (pic above). Last Tuesday they had the official launch night and I was invited along to try them out. The new menu has a range of gluten-free starter options such as cured meats, salads, aubergine parmigiana, Campania fries and the garlic pizza bread can be made gluten free too. If you’re vegan they have a lovely looking quinoa, chickpea and artichoke salad that’s also gluten-free or the Campania fries would be fine too. Daz and I shared the Caprese salad and Campania fries as although the salad does sound good, my belly does not agree with chickpeas! 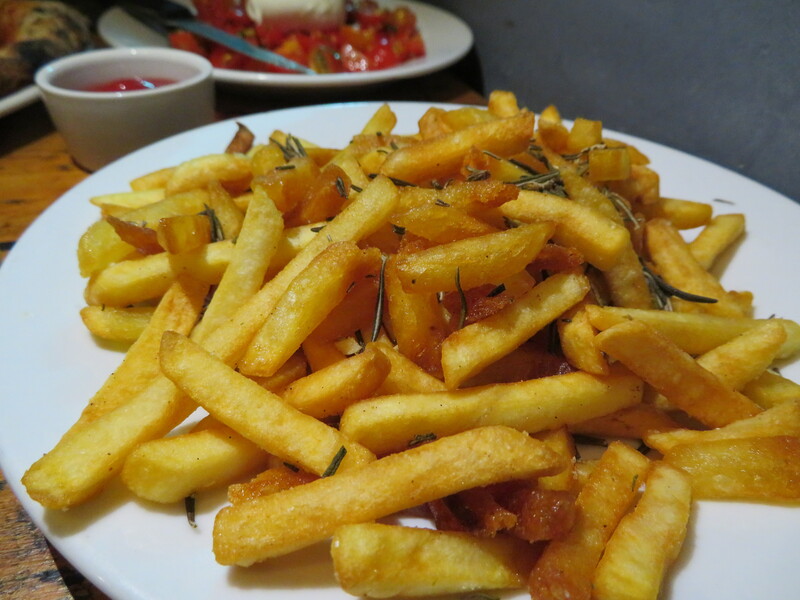 The fries were crispy, salty and incredibly moreish I think a perfect table-sharer if you’re going to give them a try. 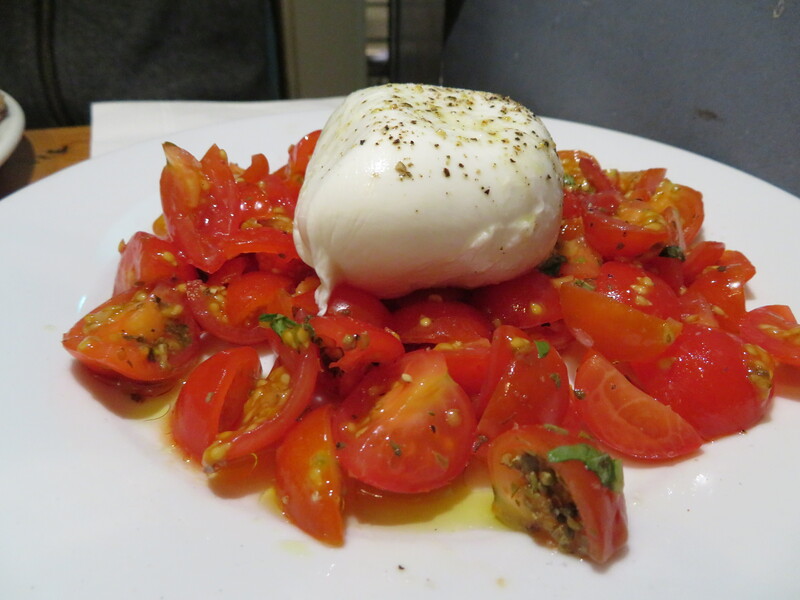 I love the tomatoes they use on the Caprese salad, they are small red cherry tomatoes that pack a punch and were perfectly seasoned with olive oil and garlic. We loved using the outer edges of the pizza to mop up the olive oil and cherry tomato juices so another table-sharer I would recommend! 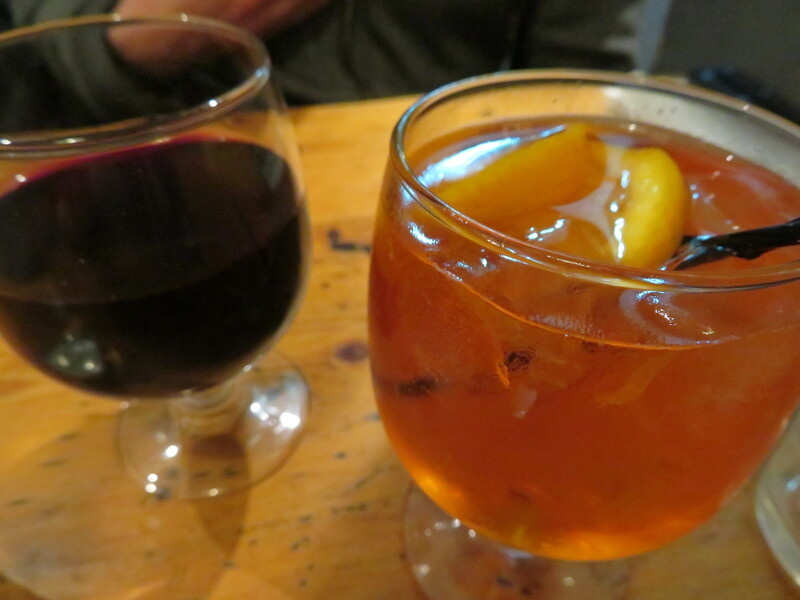 The menu has several Aperativo items to choose from as well as Italian white red and rose wines to go with your food. There are also a selection of craft beers and ales and they are now stocking my favourite gluten free beer – the Celia lager too! I hadn’t seen this on the menu as it was only launched that evening but Aperol spritz that was perfect for what I felt like anyway. I also found out they have just switched to serving Pharmacie Coffee, a local coffee roastery based in Hove who are ace. It’s so important to have good coffee with food and they have made a very good choice in roastery! Definitely try them out if you haven’t already. I decided to go all out and try a margarita pizza with the vegan mozzarella (+£1.50) and a gluten-free base (+£2) of course. The bases are made using Caputo flour – a third generation family owned business from Italy and is some of the best around. 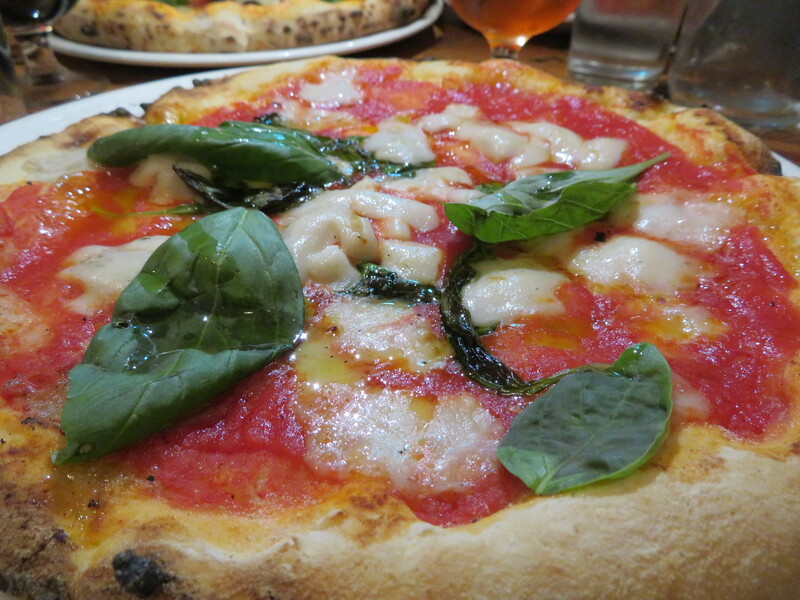 It’s designed specifically for gluten free pizzas and made up of rice, potato and soy flours and works really well to create the pillowy texture Neapolitan pizza is known for. I took a cross section picture of the base but it was tricky in the lighting to come out properly so you will have to go and see for yourself! The pizzas are all cooked in the same oven as normal bases so due to cross contamination are not guaranteed 100% gluten free. They are careful to wipe down all surfaces and use a designated paddle though but just something to note if you’re coeliac. The outer edge had lots of little air pockets and had a nice chew, definitely not squeaky which is the worst ever thing to happen when eating (I don’t like some halloumi for that reason). Daz tried it as well and was very impressed, it’s ever so slightly denser but hardly much different. He also commented that my pizza was the same size as his, as I usually end up with something smaller! It’s nice to be able to go out and order something very similar to Daz and not feel like I am served anything sub-standard or missing out because I can’t eat wheat. The vegan mozzarella is bought from Northern Italy and has been described as the ‘holy grail of pizza toppings’ by the Guardian previously! 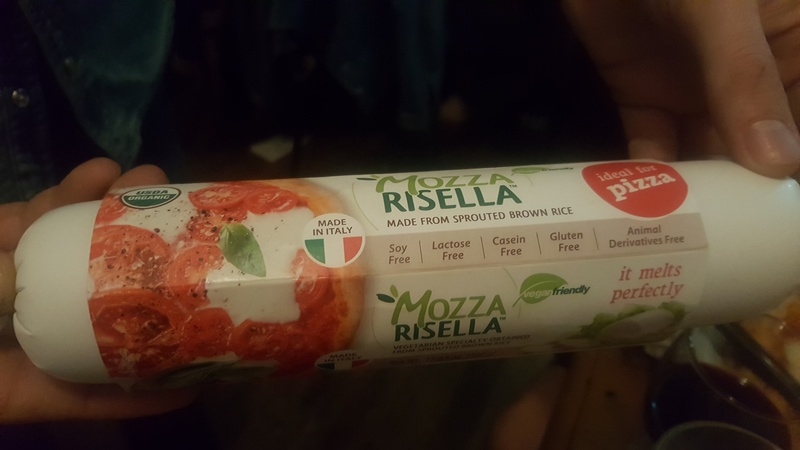 I can easily say it’s the best vegan cheese I have tried and as I try to avoid dairy ‘most’ of the time I would be happy to order this instead of normal mozzarella instead. It does of course, taste different than standard cheese, I would say it has more of a gooey texture but still satisfying and melts perfectly. Daz tried it too and thought it was hardly dissimilar from what he had. 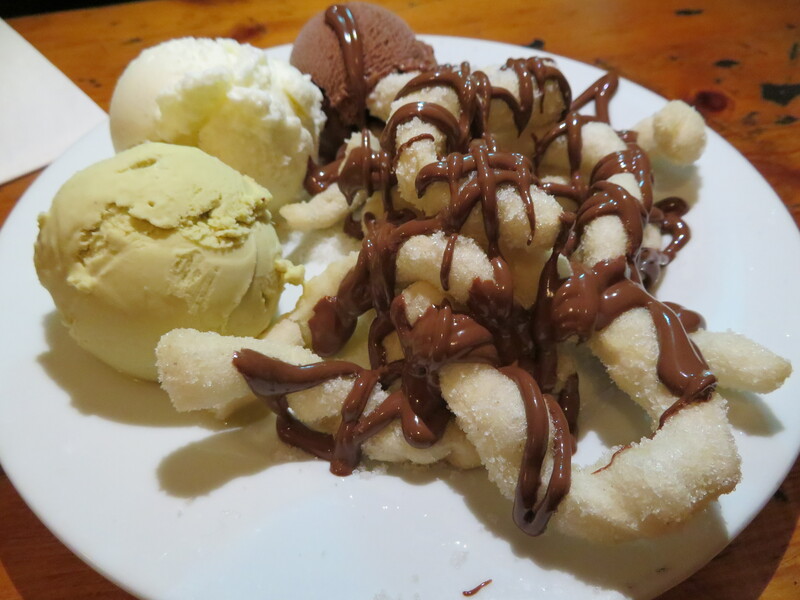 I have to say we were stuffed after our feast of pizza, salad and fries but when I was told they could now make their famous Scugnizzielli Nutella fried dough strips gluten free I had to give them a go. They are basically thinly cut strips of pizza dough, deep fried, coated in sugar and then drizzled with a generous amount of Nutella. Yep, not one to eat every day but certainly one for cheat day or a treat! The gluten free version became a little dense/chewy but the sugar and Nutella and gelato it was served with gave it enough flavour and moisture to be forgiven. I would say one of these on your own would be too much, but I think they are made for sharing anyway which is perfect. Ours were served with one of each of the gelato flavours – vanilla, pistachio and chocolate and I think the pistachio and vanilla were both my fav. If you’re too full to have these then they have scoops of gelato as an option or sorbet too which is suitable for the vegans. Yep, Fatto a Mano have done very well. As I said earlier it was really nice to have a free from pizza evening where I didn’t feel like I was missing out on much by not having the normal version! I can easily say they make one of the best gluten free pizzas in Brighton and the best vegan/dairy free cheese I have tried so far too. It’s nice to see somewhere that already has a very good product making the effort to allow everyone to eat at their restaurant by offering the best quality alternatives. My only gripe is that the London road restaurant is so close to work it’s going to be really hard to resist! 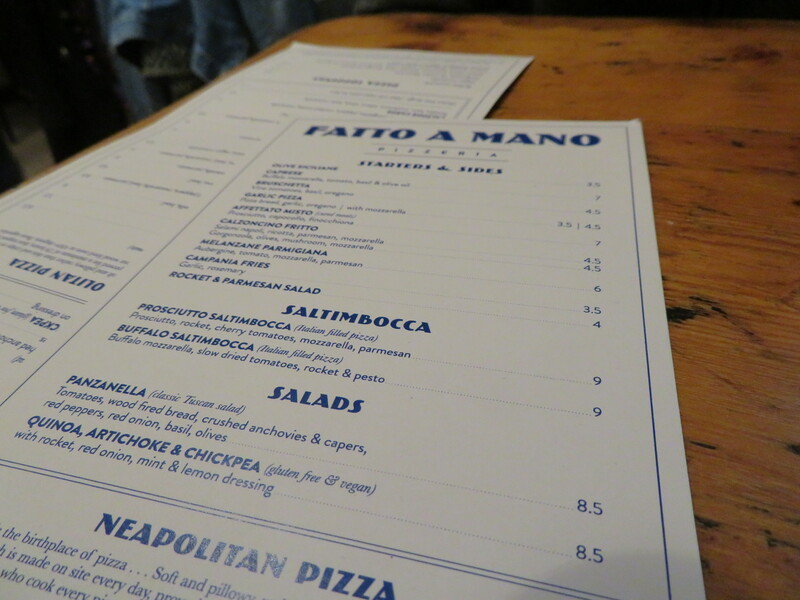 Have you tried the gluten free pizzas at Fatto a Mano? What did you think?